Cutlers Cove fixed blades, hunting and sheath knives. Be the first to know about new product additions by following us on Twitter or subscribe to our RSS feed from our new blog. A fixed blade knife does not fold. The following are fixed blades types: Hunting, Fishing, Survival, Fighting, Bowies, Dagger and Kitchen. Other names for Fixed Blade knives are sheath knife, straight knife and rigid knife. We use the terms Fixed Blades and Folding Knives to categorize all our knives. Go to the links below to see the products in each knife pattern type. Each knife is listed by size and graded on condition. The overall measurement is the combined length - blade and handle. All fixed blades come with a sheath unless stated otherwise. Click on the small knife image on each knife type page like Hunting Knives and that will take you to a page presenting at least one large image, a complete description, the price and order number. Use your back button on the taskbar at the top of your browser to get back to the knife type page with more knives. All recent additions will be added to the last page in each product section. This way you can see what's the latest knife to be added to the product's section by going to the set of links at the top or bottom of the main products pages that look like this: Page 1-2-3 and clicking on the 2 or 3. This is an example, so look for the largest number in the set of page links that look like this set. Hunting Knife, Skinning Knife, Camp Knife, Utility Knife, and General Purpose. We place hatchets, axes, machetes and other cutting items here. Many survival knives have hollow handles to put survival gear into. Some have a saw on the back of the blade. Most are large knives. Not many good ones still being made. They are made for basic survival and as a emergency tool. Usually very stout and heavy duty. May be double edged with two sharp edges or have a sharp and a dull false edge. A good example is a sub hilt fighter. Many are military or tactical knives. Usually large, heavy duty, and designed primarily as weapons. Some are made as a bowie style hunting knife or camp knife. Usually double edged with two sharp edges. A few have a sharp and a dull false edge. We sometimes have nice old carving sets, old Gerber and other kitchen knives. We do not deal in flatware. We specialize in factory made knives, but because we like all types of knives, we do sometimes have a few customs. Check us out regularly because our stock changes. In this area you will find knife sharpeners and other knife accessories that are good for your knives. Knife sheaths, older empty knife boxes and more. Check our books on knives and other related items. Knife books often contain valuable information that cannot be found anywhere else. We have vintage knife magazines also. Just Reduced is a way for us to move knives, and other items that we have had to long, or to make more room for new incoming stuff. When they are moved they are gone! So check back often and see what's Just Reduced! Knives truly make great gifts. They are the type of gift that last for years. So give a knife for years of giving. 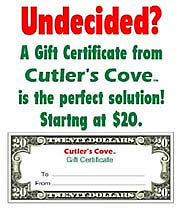 Click image to Gift Certificates. KnifeWebGuide.com Network features over 2,400 knife, sword and cutlery web site listings, along with extensive how-to articles, book suggestions and galleries, make this an indispensable resource for anyone interested in knives and the cutting edge. Add to your bookmark or favorites KnifeWebGuide.com™.